#368 ------Q researcher asks question-- Dec 18 2017 20:51:20 Seconding this. The context of that train crash seems relevant. High value target aboard? ------Q response below------------ Dec 18 2017 20:53:53 We would not 'intentionally' harm a person in the pursuit of a TARGET. This was retaliatory re: ATL. Q Anon: FReepers - you have been SO PATIENT with the ping storm! THANQ YOU! 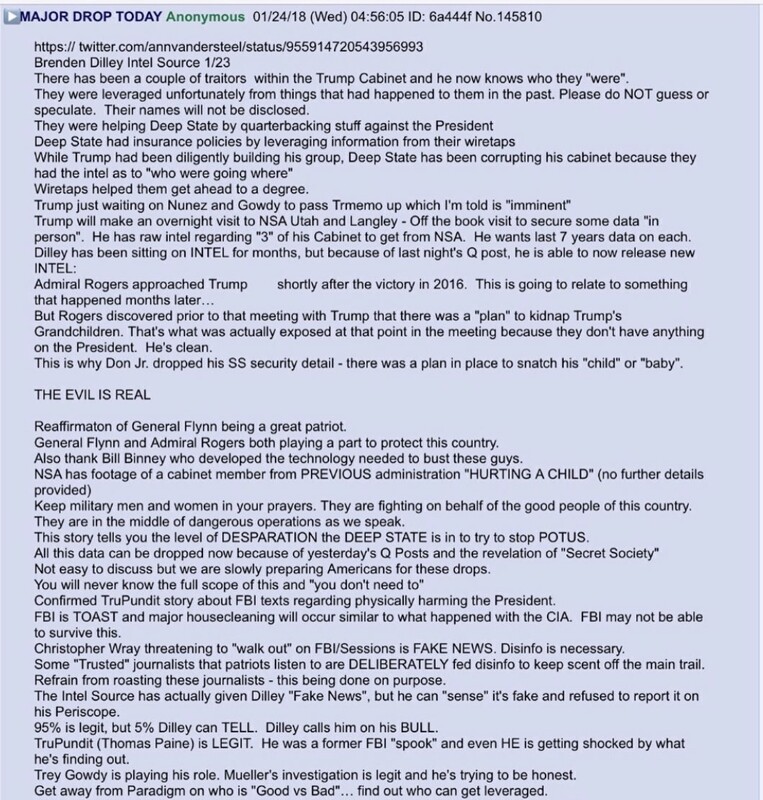 Q Anon: Latest Posting from Q: Read slowly and carefully. Q drop #625: Freedom of the Press! FREEPERS FIGHT!FIGHT!FIGHT! Q drops:#609,#610,#611 Council Foreign Relations, MILITARY DETENTION OF CITIZENS! Q drop #602 "DEMS: RELEASE THE MEMO IS TIED TO RUSSIAN BOTS"
The great Q wager. Are you in? i.imgur.com ^ | 1/24/2018 | Combination, references Brenden Dilley content? The following content is from an anon (anonymous poster on the same type of boars that Q uses) that preceded Q, via Brenden Dilley, Congressional candidate. The content is compatible with the information I've reviewed so far but offers greater level of detail and key clarification. Image of Q drop #597 (Jan 23 2018 17:26:55) The image has a large black banner bordering the text so most will have to scroll down to see it. Phone users may have to hunt.